Just to get our Practical Paper Mache Project rolling, I whipped up this waste paper basket out of an old cardboard box, a bit of paper, and paste. I actually needed a waste paper basket in my office, so it will get a lot of use. I made it big because I get a lot of junk mail. 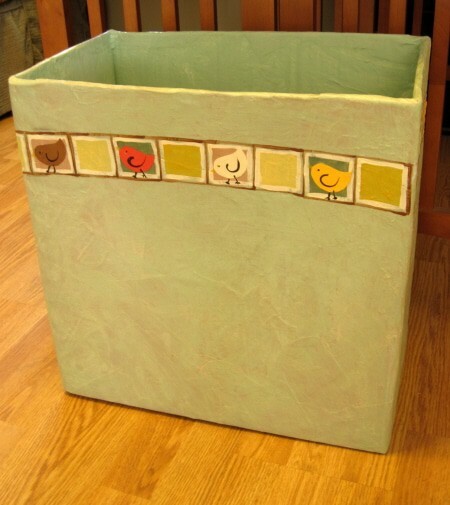 A custom-made waste paper basket – how cool is that? The new Practical Paper Mache page is now “live,” but so far this is the only project on the page. It will look so much better after we have a few more items to show off, so I hope you’ll send in your own projects soon. In case you missed it, here’s the submission form. I am in the process of making a couple of bathroom cabinets, using carefully chosen boxes from Costco (free!) as bases. One set has been glued up and the other will be by the end of today (I hope). Then I will use paper mache (that I will strengthen with wood filler and PVA glue) to fill some of the holes and unwanted indentations, round the raw edges of the cut corrugated board, soften the bonded edges and cover the bright coloring on the printed boxes. Next comes a coat of hard enamel paint or floor paint followed by some kind of varnish that will allow me to wipe the cupboard with a damp cloth and mop up any liquid, toothpaste or talc powder that gets spilled on the shelves. Great project – and of course it will work. Please let us see it when it’s done. I am taking photos as I go. If you let me know how to upload one I would be happy to provide an indication of progress so far. The boxes are now glued together will be ready for the smoothing paper mache coat as soon as I am satisfied that the glue is completely set. I am a little nervous about the next step as it is experimental. I am now annoyed with myself for throwing out a couple of bags of shredded paper when we moved to our new house last month. Ah yes – if we throw it away we always find a use for it, just a few weeks later. It always happens. The instructions for uploading photos can be found here. The system isn’t perfect, but it seems to work most of the time. Or, even better, hang onto all your photos and submit them to our Practical Paper Mache project using this form. The form only allows one photo attachment, but just remind me that you have more and I’ll let you know how to send in the rest of them. That way, all your photos will be published on the blog together, instead of scattered throughout the comment section, where older comments tend to get lost. I can’t wait to see your cabinets – what a clever idea. My bathroom could use some shelves like that. Do you intend to cover them with paper mache? Did you see Tani’s idea for waterproofing the cardboard first to keep it from warping as the paper mache dries? It’s below the photo of her desktop junk drawer. Yes, I saw her posting and had already decided to follow her suggestion, although I might adjust her recipe a little. Toilet paper is so fragile, and transparent, that you might have trouble with it. Let us know if it works. There’s always plenty of discarded printer paper in our household. It’s full of computers. I want to participate, but I am not done and no pics. But I will be glad to take them along the way and a final one. I have been working slowly on this. A paper mache frame for a wall mirror. The mirror was discarded, so I just have been working on a unique frame that I could not buy anywhere! I hope I can get it all done and be involved. I just thought it would be fun to see what I could do with that idea before I read about your idea! How timely! I hope I have enough time to work on it and submit it, if no I will still share my pic when it is done! A frame would be fantastic! I’ve been thinking about making one for ages, but I haven’t been able to figure out how to keep it from warping as the paper mache dries. I can’t wait to see yours when it’s finished. If you have how-to pictures, that would be even better. If you don’t get it done right away, no worries. We want to see it whenever it’s finished. But deadlines are good for the creative juices, don’t you think? That’s beautiful and totally up my alley! Thanks Paco. By the way, can I put your wonderful video on the new Practical Paper Mache page, and a link to it (and to your website, of course) in the eBook we’re all creating? It was really the first “entry” for the project, but I thought I should get official permission first before adding it to the new page.